Don’t you just love animal crackers? Yummy cookies in the shape of teeny cute animals? I know I do! 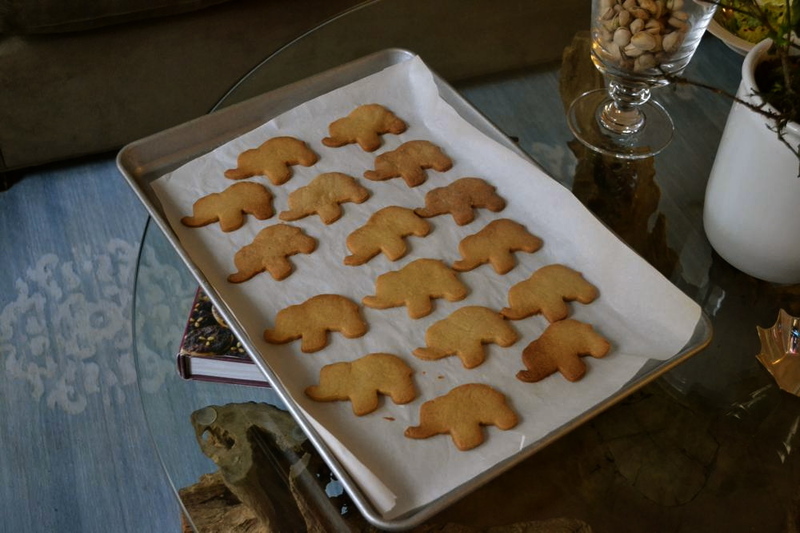 Something funny happened on Thursday, I woke up with a strong urge to make my own animal crackers – why? I have no idea! I don’t normally crave this type of cookie, chocolate chip is my usual but for one reason or another I got up, went to the kitchen, and proceeded to make my animal crackers. Sometimes I find a lot of faults with cookies, they’re too hard, too soft, too sweet, too bland but this recipe that I used came out just right. It’s actually a basic sugar cookie recipe which I adapted from a few recipes out of cookbook, The Homemade Pantry and another recipe out of the Williams Sonoma catalogue which I receive every month. My one fault with this recipe is that the dough can be a little difficult to work with when rolling, cutting out the shapes and transferring to your baking sheet. The dough is so delicate that it just wants to fall apart but stick to your guns and eventually you’ll get there! Just remember, if you have this problem like I did, make sure your countertop is well floured and that you sprinkle some flour over the top of the dough before you roll it. These two tips are key. Despite my annoyance from trying to get the dough to listen to me, I really enjoyed making these cookies and my family loved eating them. This time I made them with margarine as I was serving them at a dinner with a lot of meat served, and if you remember I am kosher but they tasted just as good as if I had used butter, although I may be a little biased. Over a small bowl, sift together the flour, baking powder, salt, and nutmeg. Set aside. In a separate bowl beat the butter on high speed with a hand mixer for 2 minutes or mix well by hand with a wooden spoon. Reduce the speed to medium, slowly add the sugar and beat for 2 minutes. Add the egg and vanilla and beat for 1 minute. Stop mixing and add half of the flour mixture. Beat on low speed until most of the flour has been absorbed. Add the remaining flour and beat until all of the flour has been absorbed and the dough starts to pull away from the sides of the bowl, 2 to 3 minutes. Turn the dough out onto a work surface and divide into 2 equal balls. Shape each into a disk and wrap separately in plastic wrap. Refrigerate for at least 2 hours or up to 2 days. Remove the plastic wrap and place the dough on a floured work surface. Lightly dust the top of the dough with flour. Line several baking sheets with parchment paper. Dip circus cookie cutters into flour just before using and cut out the shapes, then once cut out transfer to the baking sheet. Gather up the scraps, reroll and cut out more cookies. I love animal crackers! Such a fond memory from childhood. I love animal crackers. Great idea for a post! I’m pretty sure these would be an endangered species at my house … Yum!